thebahamasweekly.com - Rob Rothwell becomes winner of the sweetest ride in the country! Rob Rothwell becomes winner of the sweetest ride in the country! Alicia Wallace of Ride for Hope congratulates Rob Rothwell who was the highest bidder in the Ride for Hope charity auction. 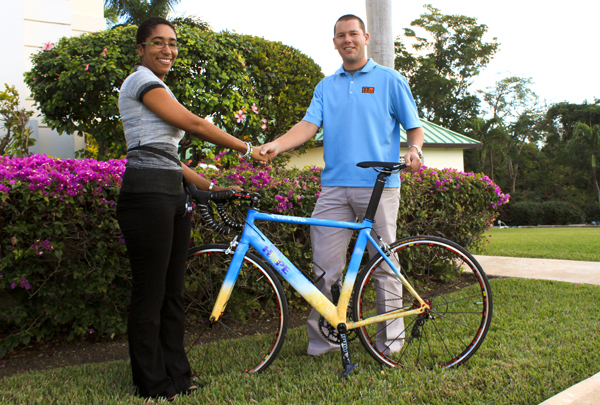 Nassau, Bahamas - Ride for Hope held its first email auction, of a Ride for Hope branded Cervelo bicycle, in December 2011. The custom built and painted bicycle, with parts by Cervelo, Mavic, Rotor, and SRAM, proved to be a hot item. Bids rolled in up until the final hours of the four week auction. The winning bid was placed by Rob Rothwell. From he placed his first bid, he stated in his email, “Fingers crossed I will be riding it in Eleuthera on April 14th 2012!” Rothwell has been cycling for pleasure since he was 14 years old. He has participated in a few local races with the New Providence Cycling Association. He also competed in the 2011 Nassau and Freeport Conchman triathlons. The bike was presented to Rothwell by Alicia Wallace, Ride for Hope Administrator, on Monday, January 9. Ride for Hope is looking forward to seeing the “RFH bike” at Ride for Hope 7. It is sure to have lots of admirers. The Ride for Hope is a registered charity. Its flagship event is a fund raising bike-a-thon held each Spring in The Bahamas. Participants have called the Ride for Hope "a truly inspiring weekend." Every dollar raised by participants without exception is applied to the improvement of programs for cancer treatment and patient care.